This year’s European Group of Organizational Studies (EGOS) Colloquium in Montréal/Canada featured a sub-theme devoted to the “Communicative Constitution of Organizations” (CCO). Sub-theme convenors Francois Cooren (U de Montréal), Tim Kuhn (U of Colorado at Boulder), and Dennis Schoeneborn (U of Zurich) were delighted to see so many promising and intriguing papers that all deal (in one way or another) with the CCO perspective. The sub-theme started off with an inofficial preconference workshop on “CCO & methods”, organized by Consuelo Vasquez (UQAM) and Steffen Blaschke (U of Hamburg), that resulted in intense discussions and helfpul feedback to early-stage research. 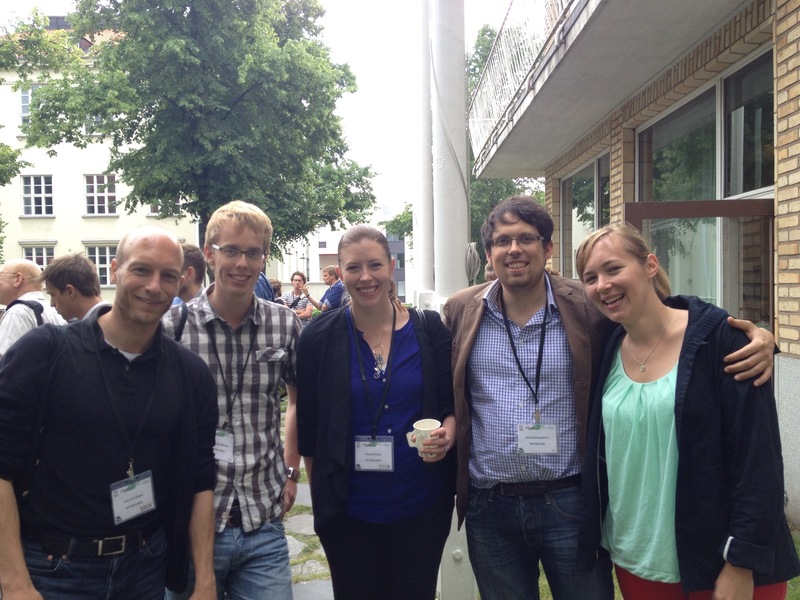 The EGOS sub-theme itself was characterized by a great variety of paper presentations, fruitful discussions and feeback, as well as a lot of fun. 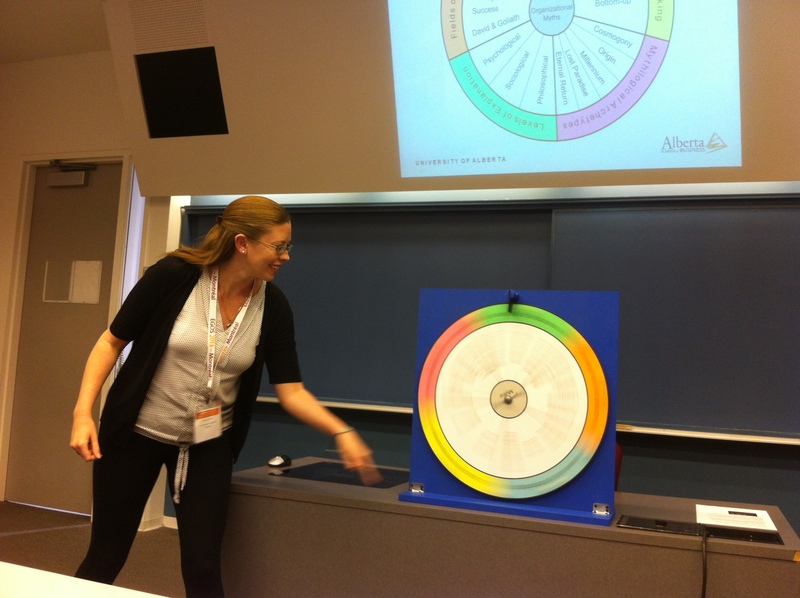 The pictures below show, for instance, one of the entertainment highlights of the sub-theme: Maxim Ganzin (U of Alberta) and his charming assistant Amanda Porter (VU Amsterdam) spinning the “wheel of fortune”, as part of Maxim’s paper presentation on the role of myths in the communicative constitution of organizations. We are very much looking forward to continuing the conversations at EGOS 2015 in Tallinn/Estonia at the very latest! Next year’s EGOS is approaching fast with the deadline on January 14, 2013, only a few weeks away. Several tracks are of interest to CCO/OaC scholars. Of course, there is The Communicative Constitution of Organization: Organizations as Precarious Accomplisments hosted by our very own Dennis Schoeneborn, Francois Cooren, and Tim Kuhn. Also hosted by another member of this here circle of scholars, namely, Alex Wright, is Organizing Performativity: Bridging Theory and Practice within and across Organizations. It’s common courtesy at EGOS to stay with your track throughout the entire conference, which is why you need to choose to participate in just one. Let me give you a sneak peek at what you may be in for if you decide to join Dennis, Francois, and Tim. What you see is an organization displayed as a network of communication episodes, much like the one you already saw in our respective paper recently published in Organization Studies. There 439 communication episodes, each one represented by a vertex. 55,754 edges hold these vertices together, each one representing the participation of at least one individual in two linked vertices. Thus, the network of communication episodes provides a quick overview of the themes and topics that (re)produce the organization. I’ve put in two additional information on the (re)production of themes and topics. First, the size of a vertex indicates the number of individuals who participate in a communication episode (e.g., the number of people who attend a meeting). Second, the color of a vertex indicates the time spell a communication episode takes place; there are 24 time spells on a grayscale ranging from the first spell all black to the last spell all white. With that information at hand, see how the organization comes full circle from big themes and topics central to many individuals (black vertices at the center of the network) to many, many small communication episodes clustering in the periphery, finding it’s finish with, once more, big themes and topics. I can zoom into single communication episodes and cluster thereof, making them easily accessible to qualitative interpretation of the conversations among individuals. But that’s about as far as I’ve gotten with my analysis. The general idea is to use the network (and many more quantitative and qualitative information) to illustrate organizational failure. Because it’s in there, just not that obvious right now. Now I only have to convince Dennis, Francois, and Tim to accept my half-finished paper. Four weeks to go. 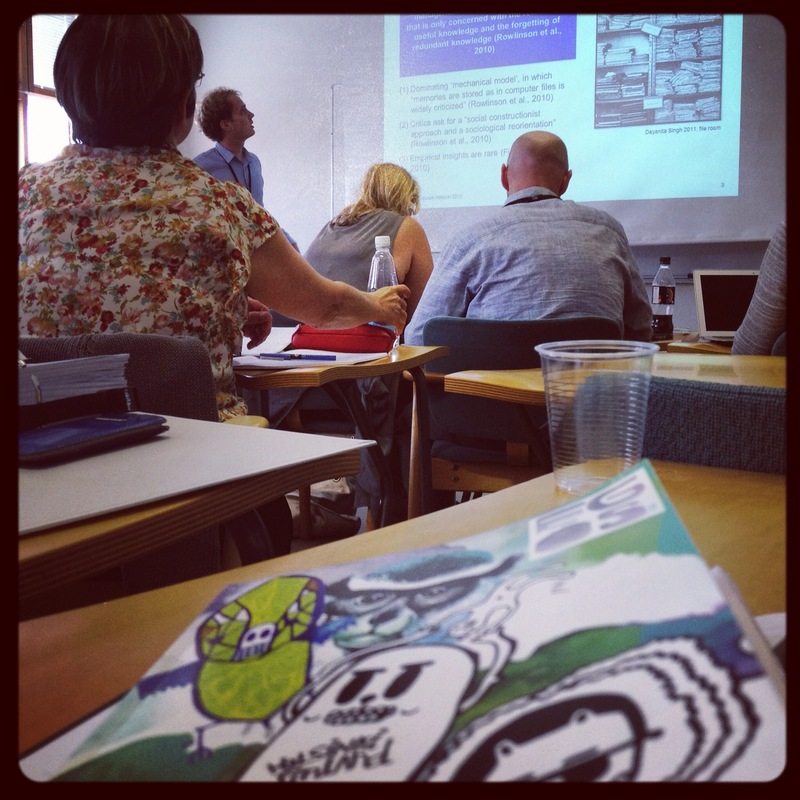 The EGOS 2012 Colloqium in Helsinki featured one of the first CCO-focused mini-conferences on European soil. The sub-theme “Organizations as Phenomena of Language Use: Interconnecting Discourse and Communication“, convened by Joep Cornelissen, Tim Kuhn, and Dennis Schoeneborn, involved 22 exciting papers (selected out of 44 submissions). 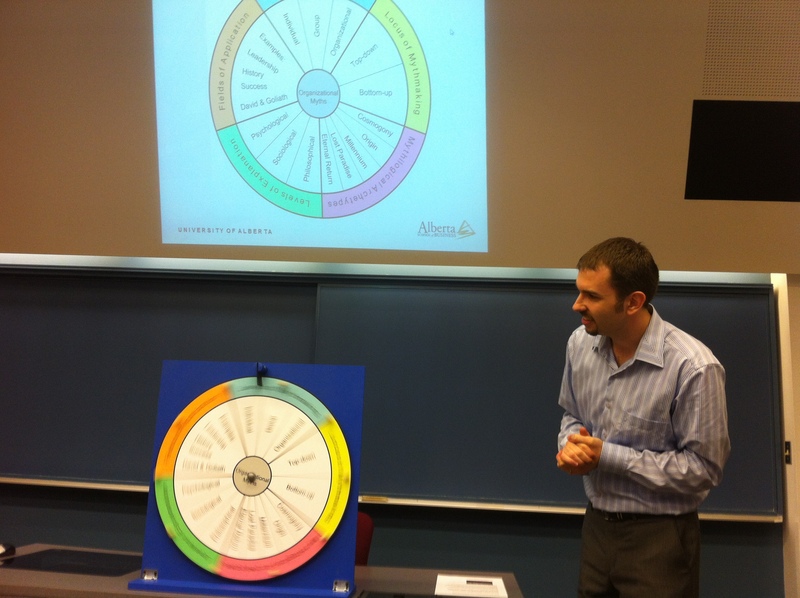 The presentations and vivid discussions shed light on various key dimensions of the organization-communication relations, such as legitimacy, identity, or the tension between emergence and purposeful design of organizational communication. Please find below two pictures from the sub-theme (powered by Hannah Trittin), incl. a couple of happy participants. And stay tuned for our related sub-theme at EGOS 2013 in Montréal (which will be jointly hosted by Francois Cooren, Tim Kuhn, and Dennis Schoeneborn)!